SPEND MORE TIME FISHING AND LESS TIME BREAKING OFF AND RETYING OR HUNG UP WITH A WEEDLESS JIG HEAD. Weedless painted jigs are hand painted with two coats of base white and two coats of the color then a coat of clear gloss is applied. As you can see they are extremely labor intensive and we are one of the few jig makers that sell painted weedless jig heads. 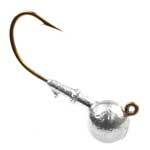 A FOOTBALL JIG HEAD THAT IMPARTS INCREASED ACTION TO A TRAILER DUE TO THE SWINGING MOTION OF THE VMC 7329 EXTRA WIDE GAP BLACK NICKEL WORM HOOK.